Add-ins are mini applications that extend what you can do with Office, Office 365, and SharePoint (2013 and 2016). For example, with Office add-ins you can use Wikipedia without leaving Word or get directions and maps right in Outlook. Add-ins are available for Access web apps, Word, Excel, Outlook, Project, PowerPoint, and SharePoint. Important: New name for apps for Office: Office Add-ins. We're currently updating our products, documentation, samples, and other resources to reflect the platform name change from "apps for Office and SharePoint" to "Office and SharePoint Add-ins". We made this change to better distinguish the extension platform from Office apps (applications). While these changes are taking place, the dialogs and messages you see in your application might be different than what you see in this article. Connectors are online apps, tools, and services, such as Twitter, Trello, or RSS, that you probably use every day to connect and collaborate, stay on top of current events, track projects, and so on. They're integrated with Office 365 Groups and take just minutes to hook up. Connectors fall into a variety of categories to suit every type of user and team, from the information worker focused on interests (Bing News, RSS) or productivity (Trello, Asana) to developer automation tools, (BuildKite), to email marketing services (MailChimp), and so on. You can hook multiple connectors to a group, and when you hook up one or more connectors, they're available to everyone in the group. No additional steps required! To get the full story, see Connect apps to your groups. Want to provide feedback about Connectors for Office 365 Groups? Please visit the Office Developer Platform Suggestion Box to leave your feedback. Click the Stack Overflow and tag your idea with Office365Connectors. How do I get an Office add-in? They’re in the Office Store, but how to get to the Office Store depends on which application you’re using. Click to learn how for Access, Word, Project, Excel, PowerPoint, and Outlook. How do I start an Office add-in? After you purchase an add-in for Word, Excel or PowerPoint, click Insert > My Add-ins, In Project, click Project > My Add-ins. Under My Add-ins, double-click the add-in to start it. If you don’t see the add-in, refresh your list of add-ins. In Outlook, open an email message where your add-in is active—for example, if you’re using the Bing Maps add-in, it’ll be active on any message that includes a postal address. Click the add-in name in the bar below the message header to open it. Can I turn off an Office add-in? Yes, either by hiding or disabling it. Click to see how to hide an add-in in Word, Excel, PowerPoint, or Project, or how to disable an add-in for Outlook. Can I turn an Office add-in back on? Yes. If it’s been hidden, you can retrieve an add-in for Word, Excel, PowerPoint or Project. If you’ve disabled an add-in for Outlook, you can enable it. Why isn’t my add-in showing up in my Office add-ins list? You may need to refresh your list of add-ins or, if the add-in is hidden, you can retrieve it. If you’ve disabled an add-in for Outlook, you can enable it. Yes. To get support for the Office Store, visit the Office Support page. There you’ll find Help articles, links to manage your account, and technical support contact information. For billing support, visit the Microsoft Account Help page, where you can manage your payment methods, review transactions, and edit your billing profile. To get support for add-ins, visit the developer’s website. 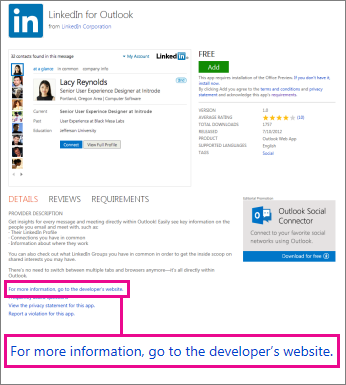 You’ll find a link to the developer’s site in the Details section of each add-in’s page in the Office Store. Instead of starting with a built-in dictionary, Word 2013 links you to the Office Store so you can pick a free dictionary or buy one from a collection, including dictionaries in many languages. See Install a dictionary for more info. How do I look up a word? Right-click any word and click Define. If no dictionary has been installed, instead of definitions you’ll see a list of dictionaries that you can download. Choose the one you want, and click Download. After you install the dictionary, Word 2013 will automatically open to that dictionary whenever you click Define. See Install a dictionary for more info. Note: In Office 2016 applications, you can use the Smart Lookup feature and the Insights pane to learn more about a word or phrase in your documents. See Smart Lookup in Office 2016 for more info. How do I get a SharePoint add-in? You can browse for SharePoint add-ins in the Office Store on Office.com, but you can only get them from the SharePoint Store. The SharePoint Store is essentially a version of the Office Store that’s accessible only from a SharePoint 2013 or SharePoint 2016 site. Is support for SharePoint add-ins available? If the add-in developer provided Help, you’ll find it through the Site Contents page. How do I remove a SharePoint add-in from a site? If you don’t want an add-in on your site, you can remove it by going to the Site Contents page.